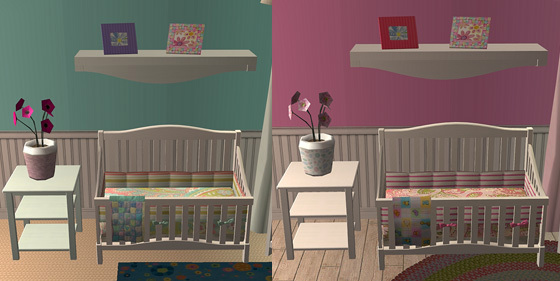 ****update 3.3.09***** it’s been reported that the rug did a strange disappearing act when moving back from the rug it would fade away. I had a friend test this for me and I was able to fix the issue. Do not worry if you downloaded this set originally, this issue will not cause any problems for your game at all. If the fading away is a problem I have included a download below of just the rug mesh that I have fixed. 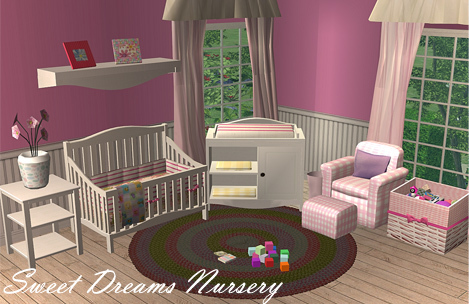 I have also added a non expansion pack required download, so for anyone who does not have nightlife can download "sweetdreams-noepsrequired.rar"
Mod Nursery Sets - Check out the new versions!